Carefully heat treated coil provides superior spring action. 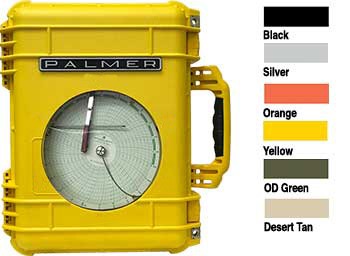 The Pelican Case is also available in six colors. 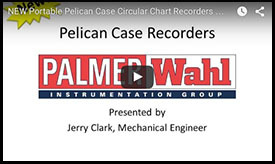 Palmer Pelican® Case Recorder - our top quality chart recorder now come housed in a rugged Pelican® case. 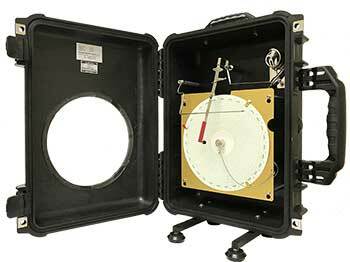 With double-throw latches these cases are designed with rugged protection even in harsh environments. Lightweight and easy to carry, the new Palmer Pelican® Case Recorder offers the convenience and protection you need in a recorder. All of the recorders have front doors that open for changing the charts, pens, or batteries and winding of mechanical clocks, if equipped. Either solid or window choice of instrument glass, shatter-proof safety glass, plexiglass. Valve and Test Connections available in 8” Chart Size in 1 and 2 Pen configurations. Valve and Test Connections are not available in 12”.